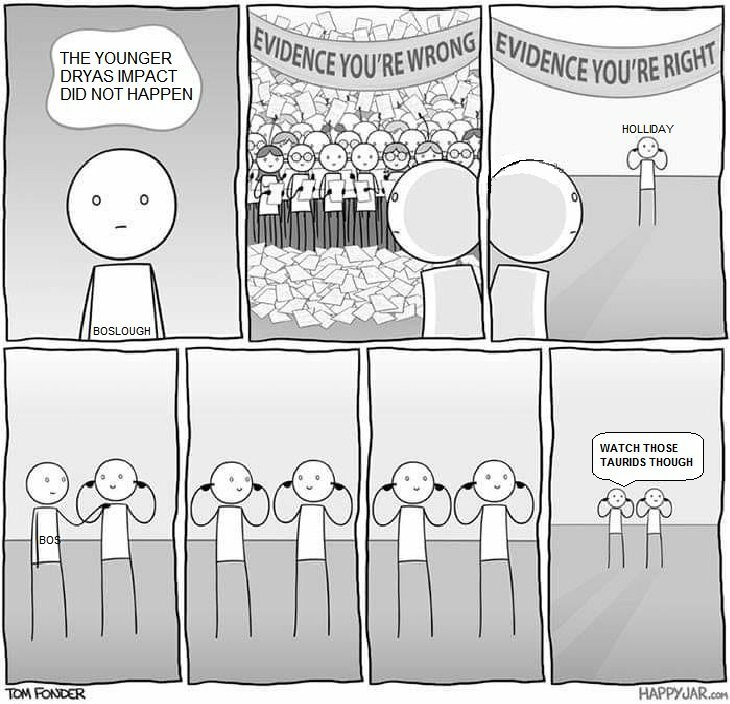 Some wag tweeted this funny cartoon today depicting the current state of affairs in Younger Dryas Boundary Research. The storyboard calls out The Bos and Vance Holliday for their willful ignorance with regard to the Younger Dryas Impact Hypothesis. The clever and extraordinarily well informed cartoonist points out the awkward position The Bos has created for himself (in the Washington Post no less). It must be complicated to ignore and defame piles of sincere and tedious peer-reviewed research supporting the Taurid Meteor Stream as a known threat, and then tip off the world to ‘watch out.’ Amazing what people can get away with in science, even when it is all written down.